Whether you call them drones or unmanned aircraft systems (UAS), they’re here to stay. Few rules yet govern the commercial use of drones, which have been banned by national parks even as Google, Facebook and Amazon draw up business plans to use the controversial devices as flying package delivery systems or wireless Internet hotspots. The fact that the regulatory universe and its aircraft overseer, the Federal Aviation Administration, hasn’t caught up to technology or industry demand shouldn’t be surprising to anyone. No one should realistically believe that the process of passing laws or enacting regulations will ever move as quickly as innovation. Advances in UAS technology are dragging the FAA, sometimes reluctantly, along. At the same time, privacy laws and guidelines are well developed and will easily adapt to this new technology. Americans with privacy concerns about drone use can relax – for now. So, where are we? The FAA has been steadily working away at the backlog of exemption requests seeking approval to operate UAS. Several hundred have been granted and, as the FAA gets better at it, the pace of approvals is picking up. To date, the FAA has approved the use of UAS for the “aerial” collection of information in cases like pipeline inspection, insurance underwriting and claims management, cell tower inspection, and agriculture. The agency has also approved drone use for movie-making on “closed sets,” where the actors and crew are in relatively close proximity to the UAS doing the filming. But Congress is impatient. Earlier this month, Sens. John Hoeven of North Dakota and Cory Booker of New Jersey introduced legislation to effectively shortcut the regulatory process and create their own set of UAS regulations to “unlock” innovation in drone use. Some have suggested there’s a certain amount of grandstanding when Congress chooses to enact laws which prescribe standards of safety and operation for UAS. The frustration of Congress, which in many respects reflects the frustration of industry leaders and donors, is understandable. The FAA got started way too late in the process. Regulators are years behind where they should be and are frantically trying to catch up. The recent announcements regarding the FAA’s push in the area of UAS that fly beyond their operator’s visual line of sight is encouraging, but it’s not enough. The FAA needs more funding and resources to do the job right. What Congress ought to be doing instead of enacting operational rules for flying UAS is give the needed money to the FAA – and then step back. The FAA is a superb organization, charged with the monumental task of insuring the safety of our airspace. And it’s a job the agency has done well. Congress should do what it does best – allocate funds – and let the regulators regulate, even if they entered the game too late and have moved too slowly. The real concern everyone should have is air safety. The rules currently proposed by the FAA set the bar pretty low for entry into the UAS business. Moreover, at least publicly, the FAA hasn’t been very aggressive so far in its pursuit of people who choose to be in the UAS business but operate without any FAA exemption or permission. During the next 18 months or so, while we await the enactment of new rules, let’s hope the FAA acts in a proactive fashion, aggressively prosecuting offenders in a manner calculated to deliver a message of deterrence. This is an area where criticism of the FAA is warranted. Too many people still see UAS as toys – as recent drone use incidents at the White House should remind us. It’s time to take off the gloves and come down on offenders with an iron fist. If Congress really wants to make a contribution, they should pass a law which focuses on offenders and makes illegal UAS operation a federal criminal offense. No one can doubt the effectiveness of the FAA and the aviation industry working together to create the safest aviation system in the world. There’s no reason why the introduction of commercial drones into that system should compromise the extraordinary level of safe operation which has been achieved. Call them drones! Call them UAS! Whatever you choose to call them, they’re airplanes operating in the national airspace. Those who choose not to recognize that fact should be dealt with severely as this new, innovate industry takes wing. Little by little, the FAA seems to be unclenching from its strict regulatory limits on commercial-drone use. Earlier this week, the agency said it would allow three companies to push past the boundaries of restrictive drone guidelines the FAA proposed earlier this year. Specifically, the FAA will allow these companies to test commercial drones that operate beyond their operator’s direct vision and, in one case, in urban areas. Would-be commercial drone operators—particularly Amazon and its proposed Prime Air delivery service—have long chafed at the FAA’s unwillingness to allow broader testing and use of remotely piloted copters. The FAA’s proposed rules, for instance, would force all commercial-drone operators to obtain FAA certification, limit flights to daylight hours and altitudes of less than 500 feet, and require drones to remain within their operators’ lines of sight. Now, however, the FAA says it will allow PrecisionHawk, a North Carolina-based remote sensing and data processing company, to use drones to survey crops in rural areas beyond visual range of their operators. BNSF Railroad, meanwhile, will do something with drone inspections of its rail infrastructure, again outside operator line-of-sight. 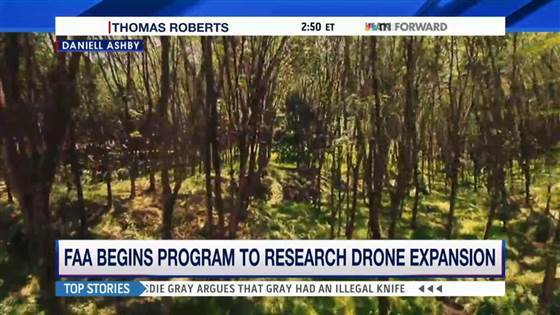 In a separate effort, CNN will explore using drones for news gathering in populated urban areas. Drone enthusiasts find the FAA’s move heartening.